Located in the Mediterranean Sea, Ibiza is one of the largest Balearic Islands. When you mention Ibiza, people automatically think: ‘party island’, however during our time there, perceptions were thoroughly altered. It is true that throughout the summer, Ibiza is booming with clubbers and party lovers but, look a little further and you will find the island is tailored for relaxation and adventure. The aim of our trip was to reach beyond the typical perceptions of Ibiza. When we arrived, a fleet of quad bikes were waiting for us outside of the airport, signalling the beginning of an exciting adventure into what the island has to offer. 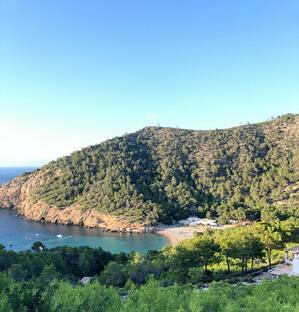 We were taken through the hills of Ibiza, stopping at points to gaze upon the awe inspiring scenery. Our tour was nearing to an end around sunset, which meant we were treated to beautiful orange and red skies; set against the mountains, beaches and greenery of the island this was a perfect way to set the scene for an alternative Ibiza experience. We finally reached our hotel, 7 Pines Resort. Recently opened it is perched perfectly upon a cliff top, surrounded by pine forest. With uninterrupted views of Es Vedrà (A legendary rock island said to be the source of energy for the island) and the pure, crystal blue waters. Our bags were delivered to our rooms alongside fresh fruit and macaroons. It wasn't long before we were whisked away for our next activity, a lesson in flamenco dance. 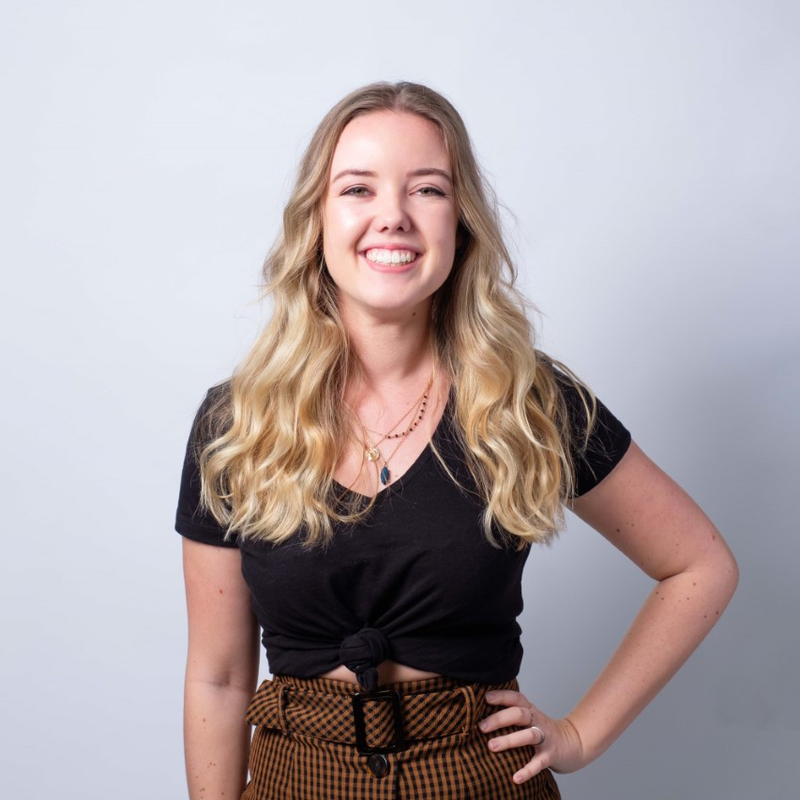 Met by our instructors (professional dancers and apparent local legends), we were put through our paces as we learnt a dance routine specifically designed for the group. We were then challenged in 'Strictly Come Dancing' style to perform for our professionals who would judge who the best dancers. This was a great activity which became a talking point throughout the trip. It was great to get the group bonding, everyone was laughing whilst learning a new skill and getting a deeper understanding of the local traditions of Ibiza. The next day began with an early wake up call. After a short walk we arrived at Es Figueral beach; to enjoy yoga as the sun rose. It was a truly astonishing experience that left everyone feeling completely relaxed and at peace. If you want an Ibizan experience to treasure, 38 Degrees North have created a DNA retreat where your own DNA is used to create the ideal retreat suited to your genetic makeup. Following the yoga class, we ventured back to the hotel where lunch was served at the hotel restaurant – The View. Although the restaurant is hidden within 7 Pines, it is regarded as one of the best in Ibiza. We were treated to simple yet exciting European gastronomy. The chef used Korean cooking techniques such as steaming, fermentation and used a Robata grill to bring out the fresh produce's exquisite flavours. After lunch, the theme of relaxation continued. 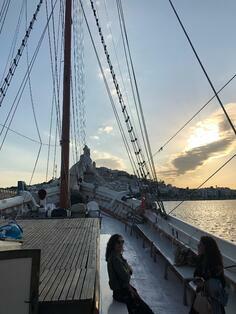 A boat trip aboard the Cala Millor; built in 1942 this former cargo ship now hosts trips around the island. The ship sailed the group out to sea where refreshments were served and an afternoon of relaxation and water sports was enjoyed by all. There is a certain tranquility in being anchored out at sea, an air of peacefulness radiates from the island, something that was noted by all. Back on dry land, everyone was suitably relaxed. A short journey brought us to our evening venue, Es Caliu – a traditional restaurant with an avant-garde style. We dined on 5 bespoke courses designed by the head chef to suit the tastes and style of the group. Evening entertainment was provided with live DJ and instrumentalists who performed chill out classics long into the night. Our final day on the island and it was time to explore Ibiza’s fun side. The day kicked off with a DJ’ing lesson. We were introduced to music styles spanning the 30 year history of Ibiza's clubbing reputation. It certainly gave a new appreciation to the skill of DJ'ing as we came to understand the challenges of mixing and fading – whilst it was a great laugh it was certainly a real eye opener! It was a true testament to Ibiza and it’s musical evolution. After all our hard work, we were taken for lunch at La Bodega – it would have been a crime to leave Ibiza without having the full tapas experience. La Bodega combines Ibizan modesty and Mediterranean freedom resulting delicious food and friendly atmosphere, a fantastic dining experience. Finally, before we left the fantastic island of Ibiza, there was an opportunity to explore further with a unique treasure hunt through Ibiza Old Town. The activity revolved around Ibiza and its history. 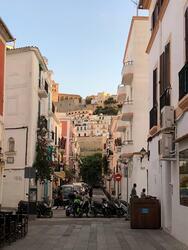 A luxury minibus dropped us off at Ibiza Cathedral, which looked down upon the town and harbour. We were split into groups, given a map and tasked with navigating our way around the town. The treasure hunt clues were based on things that we had learnt throughout our trip, ending down at the harbour. It was then time to leave Ibiza – we learnt all about Ibizan culture, cuisine, history and a lot about their way of life. Yes, in the summer thousands of people flock to the island for the world renowned clubs, but that is not the essence of Ibiza. They prioritise self-care, friendliness, adventure and relaxation.